Back to school and the start of fall, or getting back into fall routines, is my favorite time of year. It’s also, clearly, the best time of year because it’s my birthday (well, I guess I’m a little biased, haha)! Similar to January, the start of the fall can be a time to make resolutions – to eat healthier, exercise more, get more sleep, meditate every day, etc. When healthy habits are enjoyable, they can last a lifetime. Let’s all be realistic here J and make making the healthy choice, the truly, easy (and quick!) choice. If you’ve been with me for a while, you know I have some “formulas” for lunches & dinners that I use consistently to make healthy eating doable. Here’s a super simple, 5-minute formula you can use to create an easy to-go lunch. If you’re going to class or don’t have a fridge at work, it’s a good idea to get a lunchbox. Mix & match and come up with different creations that you love. For general meal prep, I recommend getting at least two different proteins and two different veggies per week, and mixing and matching them throughout the week so you’re never bored. Protein may help keep you FULL – which is why I always try to include protein in my meals and snacks. 4-5oz sliced deli meat – turkey, roast beef, etc. Just like protein, fats can help keep us full and satisfied (especially the satisfied part!). I always try to include them in my meals. I know you guys know veggies are important – they contain so many vitamins, minerals, antioxidants and fiber that are good for our whole body! Let’s talk the most delicious source of protein ever! The 2015-2020 Dietary Guidelines for Americans recommend eating more nutrient-dense foods, such as yogurt. Yogurt is nutrient-dense and many yogurts are a good source of protein and calcium. Greek yogurts typically contain more protein than regular yogurts! Eating even one yogurt every day can be an important first step toward creating a more balanced diet and a healthier lifestyle – which is what we’re all striving for! 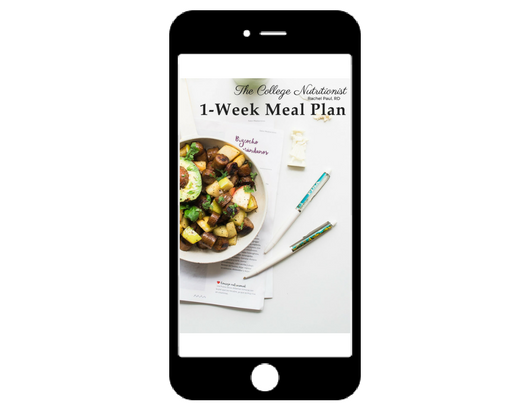 Light & Fit can help make our fall meal routines easier! That’s where whole grains and desserts can come in! Whole grains contain fiber, B-vitamins, iron, and magnesium – so not only do those delicious carbs fill us emotionally, but they help keep our bodies running smoothly. If you’re like me, you also enjoy a treat every day. I like adding a small, single-serving amount of chocolate – but you should find what works for you! OK! Now that you have the “formula” down, let’s talk examples! 1 (5.3 oz. serving) Light & Fit Original Greek Strawberry Cheesecake yogurt + 1/8 cup nuts – I’m using pecans here, but you can use whichever you like! Which are YOU going to try? What are you going to make for lunch this week?? Leave a comment below!